Chocolate, salted caramel, whipped peanut butter, shortbread. Yup. 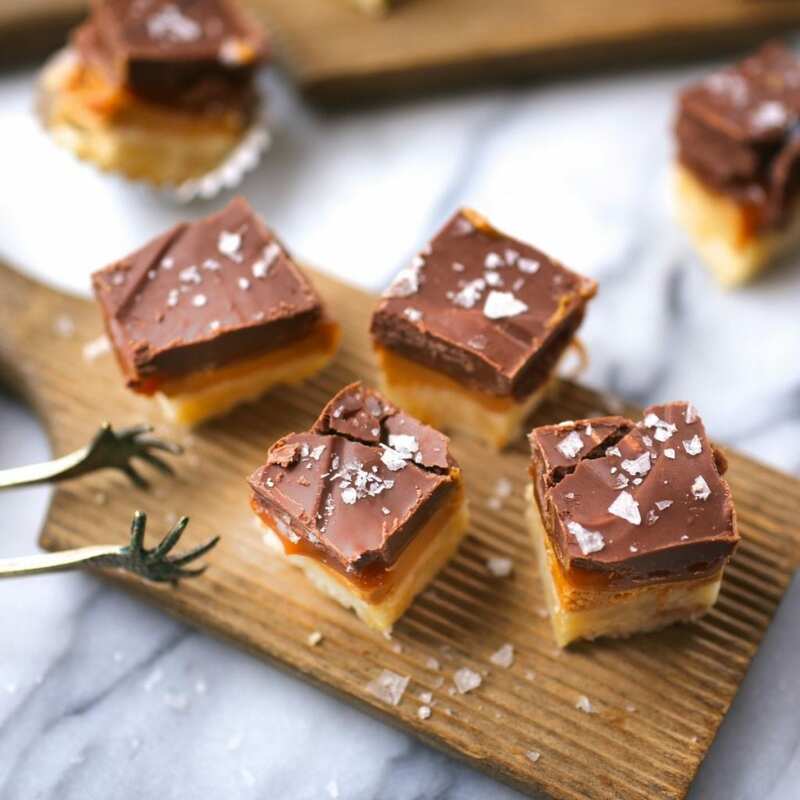 These salted caramel peanut butter bars – in miniature bite-size form – are about the best way to win over someone’s heart. They may also offer you their kidneys, liver and spleen. They’re that good. We’re taking a week off to transition the house from post-Thanksgiving chaos to pre-Christmas jollity (move all the furniture back where it came from, vacuum the last bits of piecrust off the dog, etc, etc) so this is a repost of a favorite recipe from a couple of years ago. This, my friends, is one of those recipes that goes there. And by “there” I mean to that place of ultimate deliciousness that defies logic and reason. It takes all the elements that make treats actually a treat and truly (madly, deeply) delivers what it promises. Sweet, salty, peanut buttery, caramel-y, chocolatey, cookie-ey. 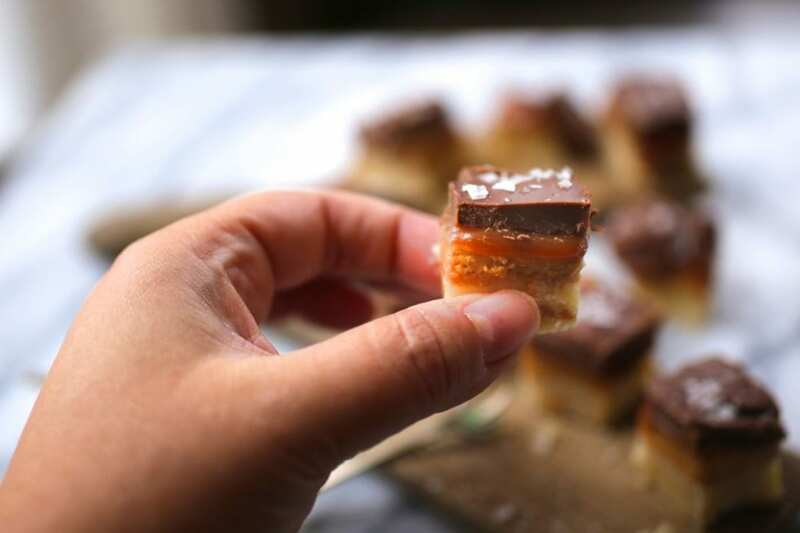 All in one teeny little salted caramel peanut butter bar bite. I like to cut them into tiny, bite-sized squares. The one thing these beauties are not, is neat. The caramel is a little drippy. The chocolate top might crack a bit (especially if you try to cut them in the tiniest squares possible). Believe me when I tell you; none of this matters. Not one tiny, messy, delicious bit. A little sprinkle of Maldon salt gives them a nice, crunchy texture. You could use your favorite jarred caramel sauce but it’s so easy (and much cheaper) to make your own. Tastier too. Our Salted Caramel Sauce recipe has step by step instructions. You can make the caramel sauce several days ahead and just warm it to a pourable temperature when you’re ready to use it. Less than a minute in the microwave should do it. This is not the place to use home-made or “natural” peanut butter. It’s much thinner and tends to separate which will give you an oily filling. You want the supermarket standards here, like Skippy or Jif. 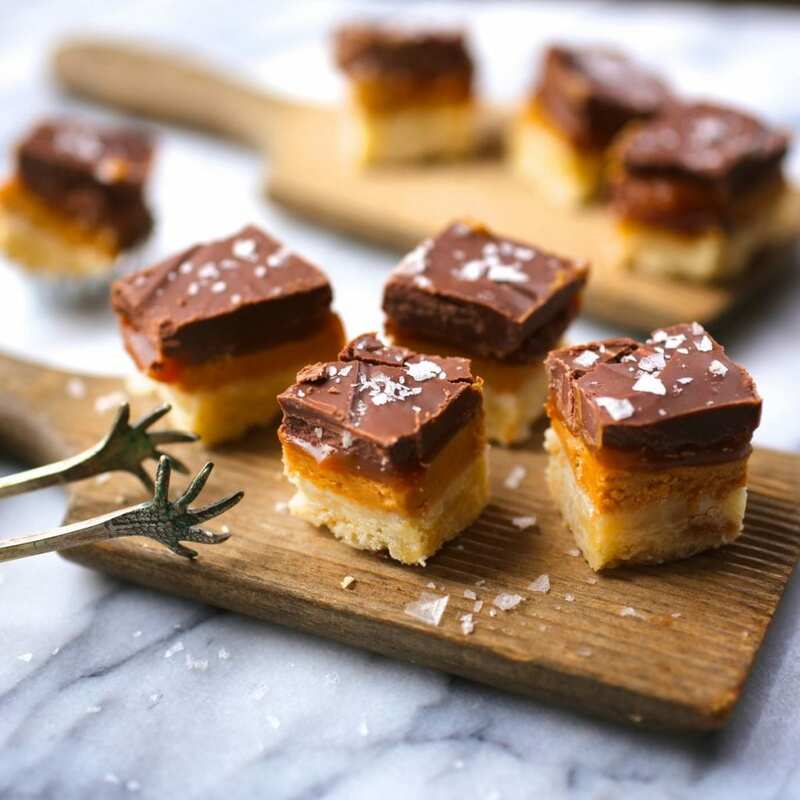 The salted caramel peanut butter bars would be great with a dark chocolate top so use whatever you like best. Whipping the peanut butter makes it much lighter and easier to spread. Do not skip lining the tray with foil. These would be very difficult to get out of the pan otherwise. I based the recipe off of this one from Averie Cooks. She has lots of great bar cookie ideas. Preheat oven to 350F. Line an 8-inch square baking pan with aluminum foil leaving a few inches of overhang. Spritz lightly with cooking spray; set aside. Shortbread Crust - Combine all ingredients in a medium mixing bowl, and mix lightly with a spoon or your fingers just until until a sandy, crumbly mixture forms (do not over mix of the shortbread will be tough). Tip the mixture into the prepared pan and press crumbs down to form an even flat layer of crust with your fingers or the bottom of a flat measuring cup. Poke crust with a fork in a dozen or so places so steam can escape while it bakes. Bake for 12 to 15 minutes, or until crust has just barely set. It should not take on any color, but crusted over and set. While crust bakes, make the filling. Peanut Butter Filling - Melt the butter in a small microwave-safe bowl, about 1 minute. In a bowl of a stand mixer (or using a hand mixer), add the peanut butter, sugar, melted butter and vanilla and mix until smooth and fluffy (2-3 minutes). Using an offset spatula or a butter knife, spread evenly over the (mostly) cooled crust. Cover lightly with foil and chill in the fridge for 15 minutes. Caramel Layer - Drizzle caramel sauce evenly over the peanut butter layer (make sure the sauce is warm enough to be pourable but not hot). Pour it all over and spread it into corners with a knife. Cover again and chill for just a few minutes while you melt the chocolate. Chocolate Layer - Combine the ingredients in a medium microwave-safe bowl and heat in 15-seconds bursts, stirring each time, until mixture is almost completely melted. Once it’s very close, give it a second and let the residual heat finish the melting. Remove pan from fridge and pour chocolate over caramel layer. Tilt the pan around to even the chocolate layer or, if needed, smooth it very, very lightly with an offset spatula or knife. Sprinkle salt over the top, to taste. Cover pan tightly with aluminum foil, and place pan in the refrigerator for at least 3 hours, or overnight, before lifting out with foil overhang, and slicing and serving. We found freezing the bars for 30 minutes helped with cutting but let the bars sit at room temperature before serving. If you buy jarred caramel sauce, make sure it's thick (i.e. it doesn't move too much when you turn the jar upside down). That way, the caramel layer won't spill out when you cut into the chocolate. I definitely would make this recipe, but I have no self control when it comes to the combination of peanut butter and chocolate… the addition of salted caramel too is especially dangerous! Pinned! Oh, this looks so sinful! I love anything with PB and so, I am sure, I will love this recipe. I am new to your blog and loving my stay here. Merry Christmas to you! Stay in touch!! Can’t wait to hear how they went over! Just found your blog on tastespotting! they keep rejecting me! got into foodgawker, though. This recipe is awesome. Your blog rocks! I’m in Warwick! Nice to meet you nice nerds! Hi deb, both FG and TS can be annoyingly picky but keep trying and I’m sure you’ll get in. I’ve found that tastesspotting is very picky about composition whereas FG is more concerned with good lighting. Good luck! oh these are a mess!! The caramel ran out all over the place. No way to save these. What a waste. I agree! All the right ingredients but when you try to cut them they inside squeezes out all over! Not pretty little bars like the picture! Ugh!